It is a nice phone with a good power saver facility. There are a few issues with the speaker though. It is strong and very easy to use. Good camera & chargers fast with the fast charger. Very strong. Does not break. Water proof. Apps etc consume a lot of memory & issues with the speaker. WATER PROOF. This phone has a very clear camera and is extremely user friendly. The battery drains out quickly but is very long-lasting if the double power saver mode is on. The screen does not crack or break easily like most other phones. It&apos;s very sustainable. Inbuilt memory is only 32 gb. Best phone yet with perfect balance of battery and RAM, great display and picture quality. The phone has a 5.10-inch Screen. Exceptionally smooth and powerful. Amazing camera and has a beautiful display. It&apos;s an amazing phone with a very good battery life, camera quality and display. It&apos;s very strong and water resistant. 30 Pricebaba users have written their experience with Samsung Galaxy S7. If you own Samsung Galaxy S7, please do leave your feedback too. Lowest price of Samsung Galaxy S7 price in India starts at Rs. 23,999 Samsung Galaxy S7 is available on Flipkart at Rs. 23,999. Prices updated on 18th April 2019. The Samsung Galaxy S7 is an evolution of the Galaxy S6, where Samsung decided to drastically change the design and the construction materials of the flagship device. The Galaxy S7 take everything that was good with the S6, including a metal and glass construction and refines it. The result is a device that is truly the Android smartphone to beat in 2016. The Samsung Galaxy S7 features a 5.1 inch Quad HD display with a Super AMOLED panel underneath. Thanks to the slightly smaller size and high resolution, the Galaxy S7 boasts of an incredibly high pixel density of 577PPI. It makes the text appear really sharp and crisp while pictures too have strong contrasts and punchy colours. The Galaxy S7 adds subtle curves to the glass and metal construction that we loved on the Galaxy S6, which makes the phone easier to pick up from a solid surface as well as adds much needed feeling of security when gripping it. Powering the Galaxy S7 is Samsung’s in house chipset Exynos 8890. It is an Octa core SoC with Mali-T880 MP12 GPU. The international variant of the Samsung Galaxy S7 comes with Snapdragon 820, though in India, the units sold are with Exynos chipsets. Not only do you get a super fast processor, there is 4GB RAM inbuilt to help you race through your daily tasks. While the Galaxy S7 misses out on features like IR blaster seen on the S6, it more than makes up by offering water resistance thanks to an IP68 Rating. There is also a heart rate monitor and fingerprint scanner on the device. Galaxy S7 runs Android Marshmallow with TouchWiz on top. 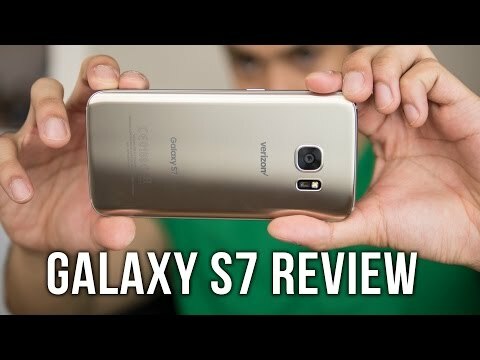 Samsung is known for armoring their flagship devices with some of the best cameras in the mobile world and it is no different with the Galaxy S7. The device comes with a 12MP rear camera and a 5MP front facing snapper. Both the lens have f/1.7 aperture making them one of the best pair in its segment. The rear camera is capable of shooting 4K videos too. On the storage front, Samsung has brought the device in two storage variants: you have the 32GB version as well as the 64GB version. If that is not sufficient the SIM slot is a hybrid one, which allows you to slot in a Micro SD card to expand the storage. Samsung has improved the battery game on the S7 when compared to S6. The bigger 3000mAh Li-Ion battery results in a slightly thicker device, but it is well worth the trade off for the improved battery life. Samsung has persisted with the Micro USB connector at the bottom and not USB Type-C. The Galaxy S7 features a hybrid SIM slot, which lets you use either two SIM card, with dual standby and LTE support on both or swap one for a Micro SD card. The usual array of connectivities like Bluetooth, Wifi, GPS, NFC are present. Samsung Galaxy S7 pits itself against the likes of iPhone 6s as well as the flagship Nexus device in Nexus 6P. You could also consider the other flagships of 2016 like the LG G5, OnePlus 3 as well as the Xiaomi Mi5 as alternatives to the Galaxy S7. Ans: Yes, Samsung Galaxy S7 works well with Reliance Jio network. Ans: Yes, the second slot of the phone is a hybrid slot Meaning in the second slot you can either use a second SIM or use a MicroSD card for storage expansion. Ans: Samsung Galaxy S7 comes with a Micro USB port for charging and data syncing. Ans: Out of the 32GB onboard storage, the user gets around 25GB of free space to install and store data. And you may also expand the storage up to 200GB via a MicroSD card if you do not wish to use secondary SIM. 5. Is this phone good for gaming? Ans: Yes, the phone performs exceptionally well and can run all games from most of the publishers without any issues. Ans: The phone comes with Android 6.0 Marshmallow out of the box. Galaxy S7 being a flagship phone from Samsung should receive Android Nougat update soon ad there are good chances of it receiving further updates as well. Ans: Rear camera on the device is excellent and one of best currently. It can also record 4K videos. 8. Is the battery of the Samsung Galaxy S7 removable? Ans: The 3000mAh battery of the phone is sealed inside the device and not user removable. 9. How long would the battery last? Ans: Battery of the Galaxy S7 holds up quite well and also supports fast charging. But carrying a power bank is recommended in case of extensive usage. 10. Does the phone support USB OTG? Ans: Yes, the device does support USB OTG with which you may view and transfer content from your pen drive or HDD to your phone. 11. Is this phone waterproof? Ans: Galaxy S7 is IP68 certified meaning it is water and dust resistant. 12. What comes inside the box? Ans: In the box you get the phone itself, a wall charger, a Micro USB for charging and data syncing and a pair of Samsung earphones.